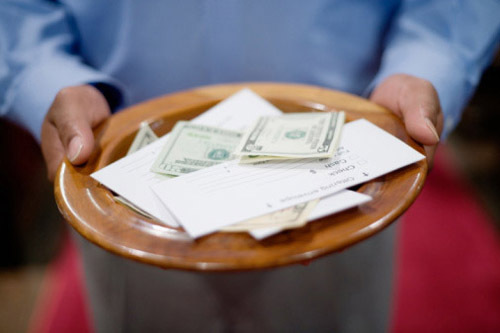 A member of Saint Peter’s Catholic Church, Ejigbo, Lagos, has been arrested for allegedly stealing money from the church’s offering box. The suspect, identified simply as Kingsley, was apprehended by the church’s private guards Tuesday and N5,000, which he allegedly stole, recovered from him. Preliminary investigation showed that Kingsley had earlier been arrested for same offence. He had gone to church on Tuesday for the regular morning mass. While other worshippers left after the service, Kingsley stayed behind, pretending to be having personal prayer time. Thereafter, he reportedly went to where the offering box was kept, brought out a glue-coated stick and dipped it inside the offering box. When he pulled it out, some money got stuck to the stick. On his way out of the chapel, one of the private security men, who saw him taking the money, searched him and recovered N5,000. He was subsequently taken to the parish priest, who directed that he should be released on compassionate grounds. Arrested However, on getting home, Vanguard gathered an argument over his misdemeanour ensued between him and his wife. He then beat his wife. The assault on his wife was reported at the Ejigbo Police Division and he was arrested. During investigation, the suspect blamed his conduct on his inability to take care of his pregnant wife.